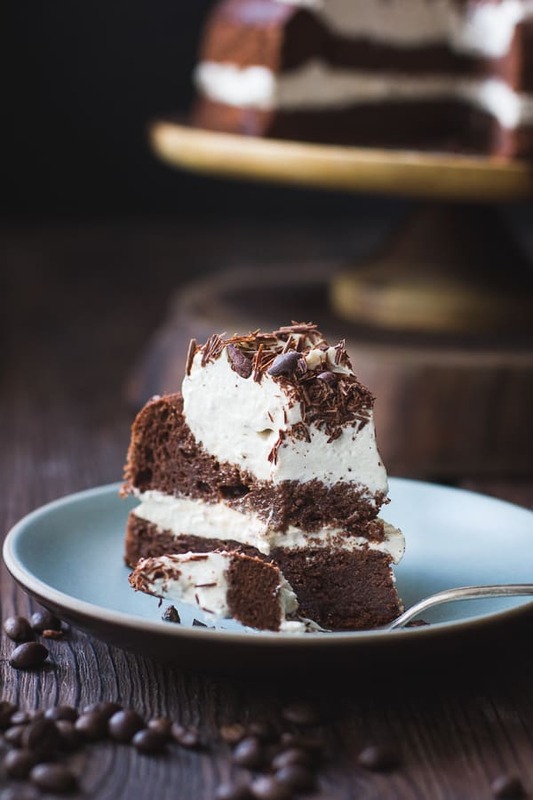 A chocolate chestnut tiramisù in essence, chestnut mascarpone whipped cream tops a gluten-free cocoa and chestnut flour chiffon cake soaked with coffee rum syrup. Heaven. My dear friend Gizella, owner of Yoga Mayu, enforcer of hideous core exercises, and giver of the most euphorically painful adjustments, invited me over for a day of cooking and eating a few weeks ago. We gorged. We watched Love, Actually. We leered at Colin Firth. Then we tucked into one of the best desserts of my life. It was decidedly less painful than one of her classes. “I can’t bake!” Gizella always says. But this dessert told a different story. 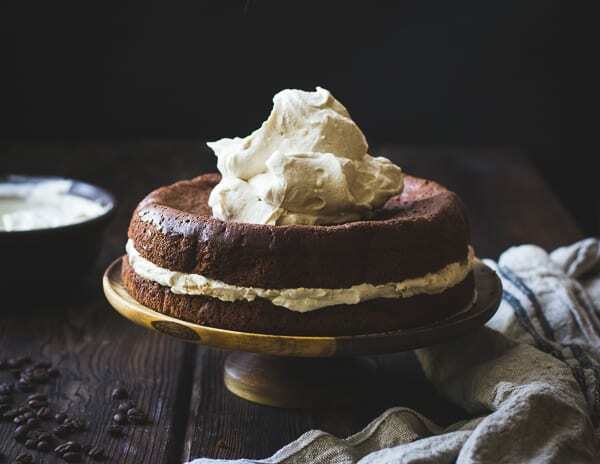 She crumbled cookies and pressed them into a springform pan, drizzled them with coffee, and topped them with a chestnut mascarpone whipped cream infused with vanilla. It struck me that I’d never had chestnuts in dessert before; they’re just not that common here in California. A slice of this dessert spawned an obsession. Days passed where I was unable to forget the taste of that delectable dessert. I had to have more. I thought it would be fun to use chestnut flour in the base, so I whipped up a chocolatey chiffon cake. Since dark rum and chestnuts get on so famously, I added some to the coffee, and I layered the whole thing with copious amounts of mascarpone whipped with chestnut cream, heavy cream, and flavored with vanilla bean and more rum. I hadn’t used chestnuts in a sweet capacity before, so I was excited to discover two of its forms, and how well they work in desserts. The first is chestnut cream, a puree of chestnuts, sugar, and spices. The kind made by Perrotta is so sublime, I had a hard time stopping myself from eating it all with a spoon straight from a jar. 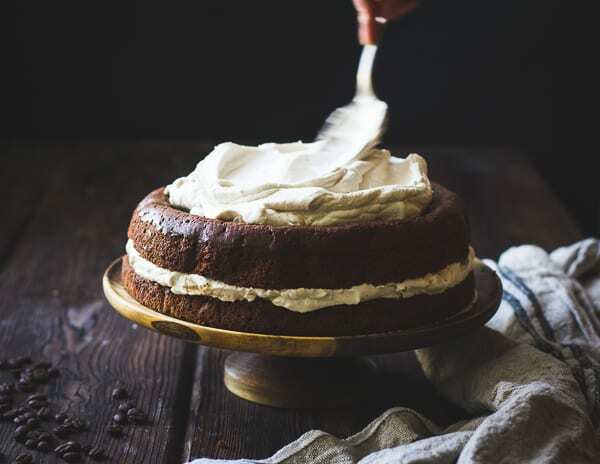 Its adds a subtle creamy density to cream whipped with mascarpone that you may find yourself obsessing over long after it’s gone. It tastes like magic. In fact, I snapped up the last jar today at the co-op and plan to use it in this ice cream. The second is chestnut flour. Tan in color and creamy-soft, starchy chestnut flour makes a good wheat substitute, hence its frequent use in Italian pastries. 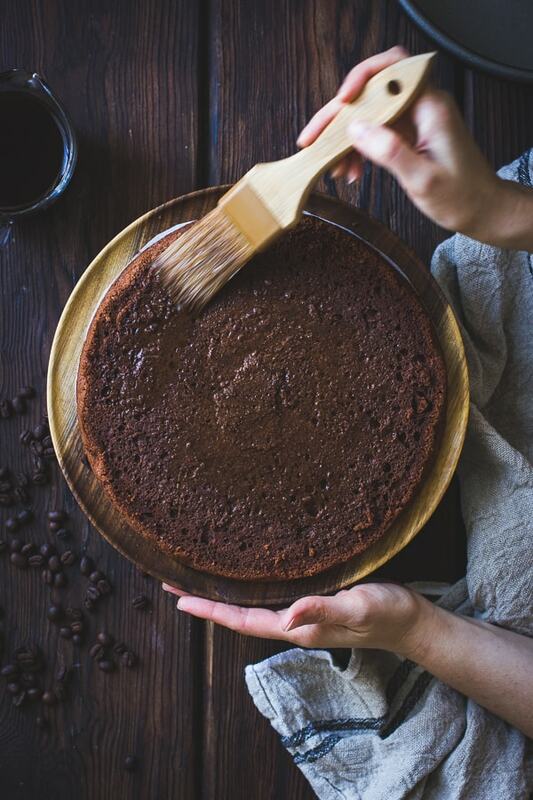 It has a warm, earthy flavor that reminds me of mesquite and makes for a pillowy soft cake that lies somewhere between a sponge cake and a fallen chocolate souffle. I’ve got my eye on some savory chestnut crepes in The Vibrant Table to use up the rest of my bag of flour. 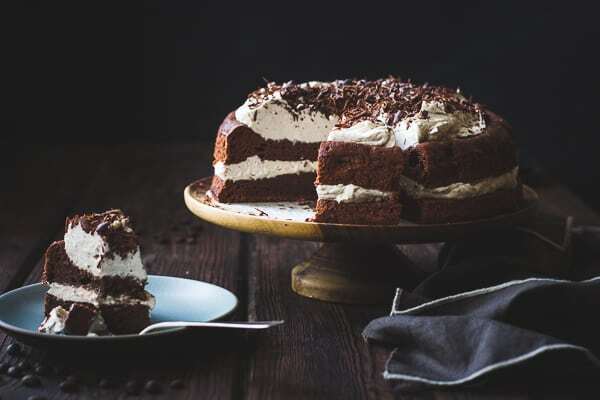 Soaked with boozy syrup and topped with lots of cream, this cake is even better after a day or two in the fridge as the layers continue to meld. It’s everything I love about tiramisù in the highly-presentable guise of cake, and it makes enough to serve a crowd. It manages to be fluffy and dense at the same time. The bitter edge of coffee and boozy whiff of rum offset sweet vanilla and cream. The chestnut adds a subtle depth that to me screams Christmas, and cacao nibs on top add a bit of pleasant crunch. away to everyone I know and hoarding it all to myself in quite a Scrooge-like manner. If so, I’ll have some more, please. 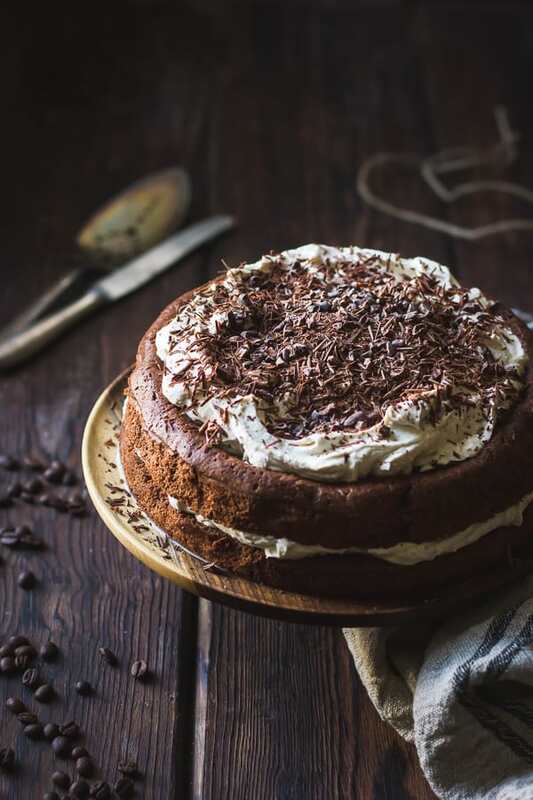 This tiramisù-like cake is even better made a day or two ahead when the components have a chance to meld. Additionally, the cake can be made 1 day ahead, wrapped airtight and stored at room temperature until needed. The syrup can be made a day or two ahead and refrigerated until needed. The chestnut cream can be made a few hours ahead and refrigerated until needed. 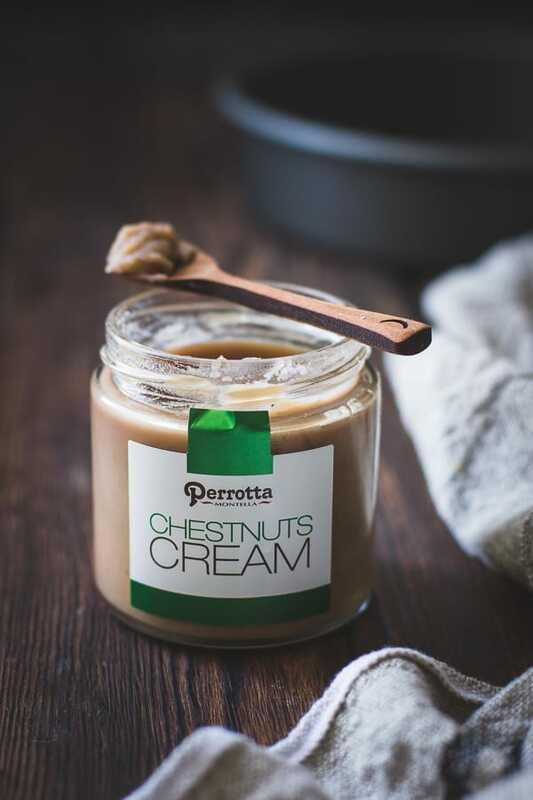 Choose a chestnut cream/puree that is sweetened; Perrotta is an excellent brand whose ingredients are chestnuts, sugar, and spices. If you can only find unsweetened chestnut puree, add sugar to the mascarpone concoction to taste. Or you can probably make your own from cooked, peeled chestnuts blended with enough water to make a smooth paste. 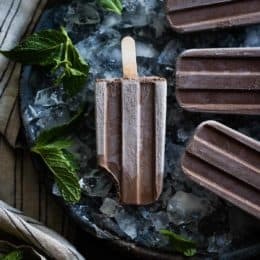 To make chocolate shavings for the top, use a vegetable peeler to pare away shards from a chocolate bar. I used about 1/3 cup. You will need 5 whole eggs and 2 egg whites for this recipe. I use decaf coffee here so I can eat as much cake at night as I like. I used 1/2 cup beans, ground, and 2 cups boiling water steeped in a French press 4 minutes, and I had some leftover for an afternoon cuppa. All ounce measurements are by weight unless otherwise stated. 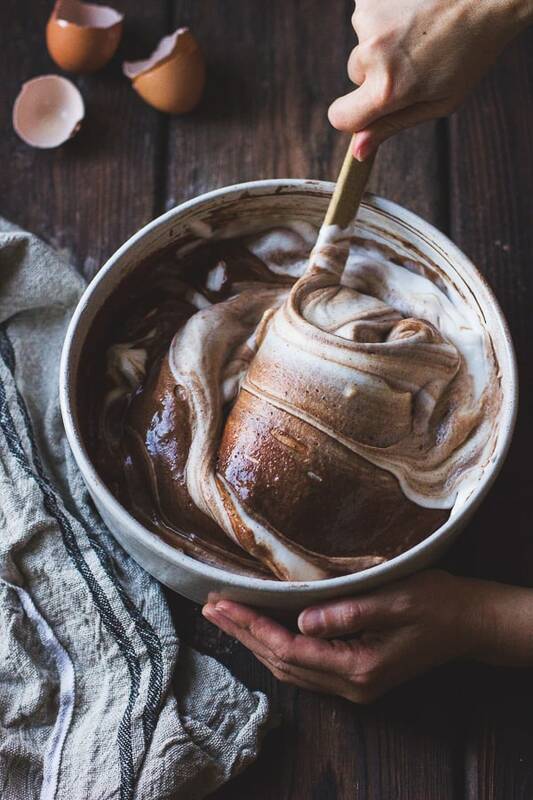 In a large bowl, sift together the cocoa, chestnut flour, sweet rice flour, tapioca starch, sugar, baking powder, and salt. 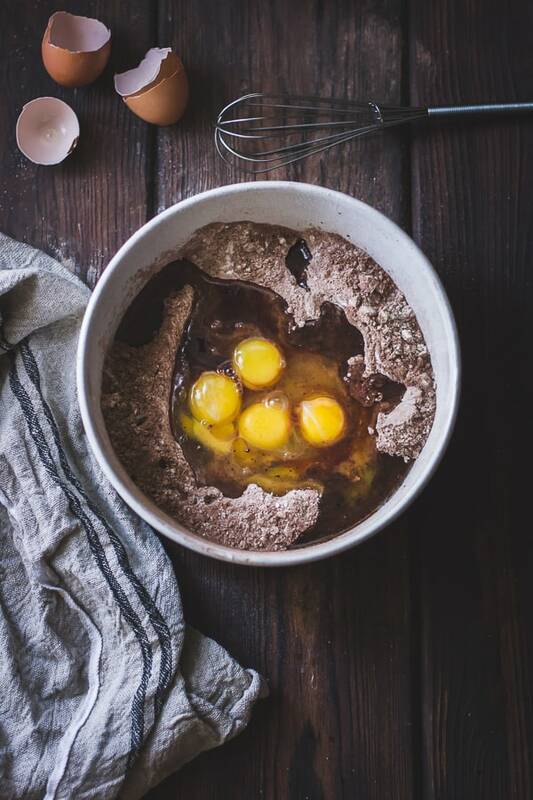 Make a well in the flour mixture and add the egg yolks, whole eggs, extracts, and oil. Whisk to form a thick, smooth batter, then gradually whisk in the water. In the clean bowl of a stand mixer fitted with the whip attachment, whip the egg whites with the cream of tartar until they hold soft peaks. 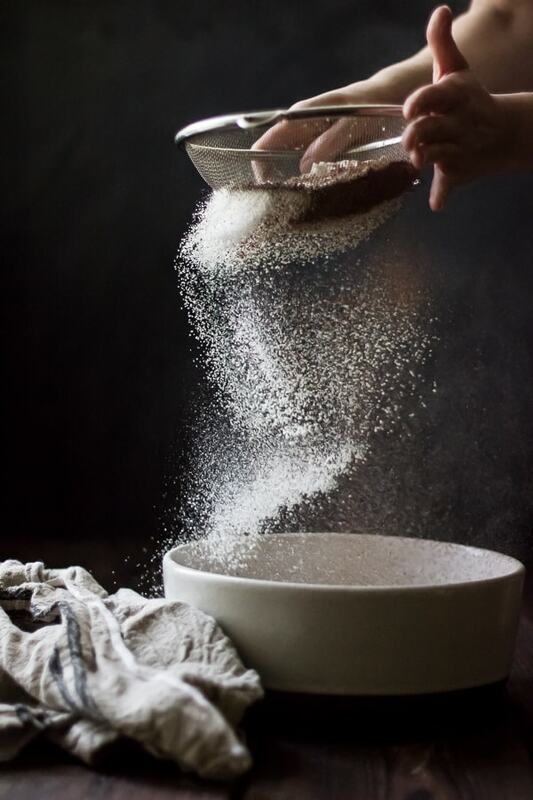 Gradually sprinkle in the sugar, and continue beating on medium until the whites hold firm peaks and look smooth and glossy. Vigorously stir about one third of the whipped whites into the batter, then gently but quickly fold in the rest of the whites. Pour the batter into the prepared pan. Bake the cake until a toothpick inserted near the center comes out clean, 45-60 minutes. Let the cake cool completely. layers as even as possible. Combine the hot coffee with the sugar and stir to dissolve. 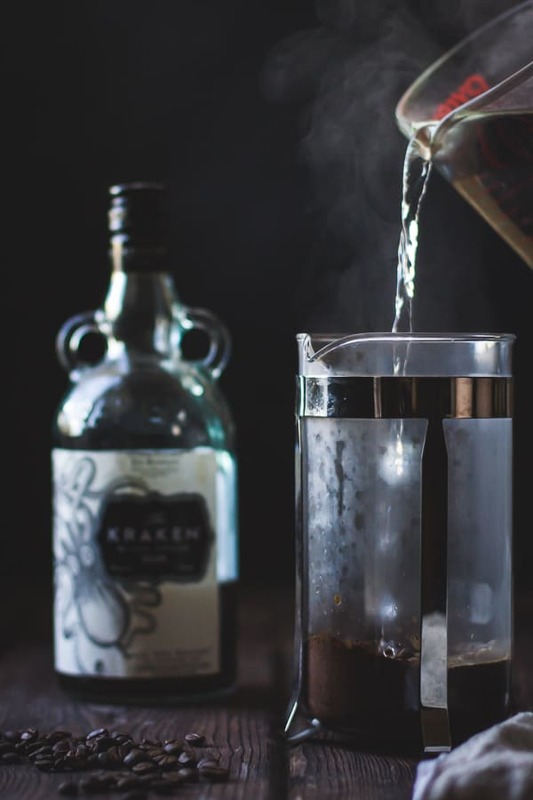 Stir in the rum. In the clean bowl of a stand mixer fitted with the whip attachment, combine the chestnut cream and mascarpone, and mash the mascarpone smooth. Add the vanilla bean, heavy cream and sugar, and whip on medium-high until the cream holds soft peaks. Beat in the rum. If the mixture gets over-whipped and starts to look grainy, you can rescue it by gently folding in a few tablespoons of cold heavy cream until it looks smooth again. Refrigerate until needed, up to a few hours. Place the bottom cake round on a circle of parchment paper set on a platter or cake stand. Use a pastry brush to soak the cake with syrup, brushing on a layer, waiting a few minutes to let it absorb, then repeating until the cake is quite moist but not soggy; I used about a third of the syrup here. Top the cake with a little less than half of the whipped cream and spread it almost to the edges. Place the top layer of cake atop the bottom layer, and repeat the syrup-soaking process. Top with the remaining cream, using the back of a spoon to make pretty swoops and swirls. 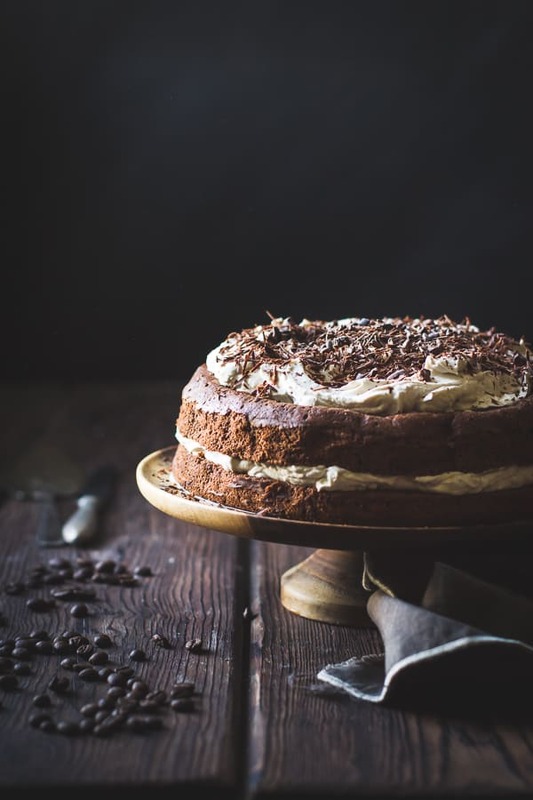 Top the cake with chocolate shavings and cacao nibs. Chill the cake at least an hour to set it, and up to a day or two. You’ll want to cover the cake with a cake dome if keeping it for more than a few hours, lest it pick up flavors from the refrigerator. The cake is best within the first two days of making it, but leftovers will keep well, refrigerated airtight, for up to five days. You amaze me with your inventiveness and cake-making skills. The way you describe all of the components of this cake made me imagine I was eating it again and now I'd like more please too. A whole cake to myself. Awwwww, you are so sweet. Thank you. One cake all for yourself coming right up. ;) Also, chestnut crepes!! I can't wait. 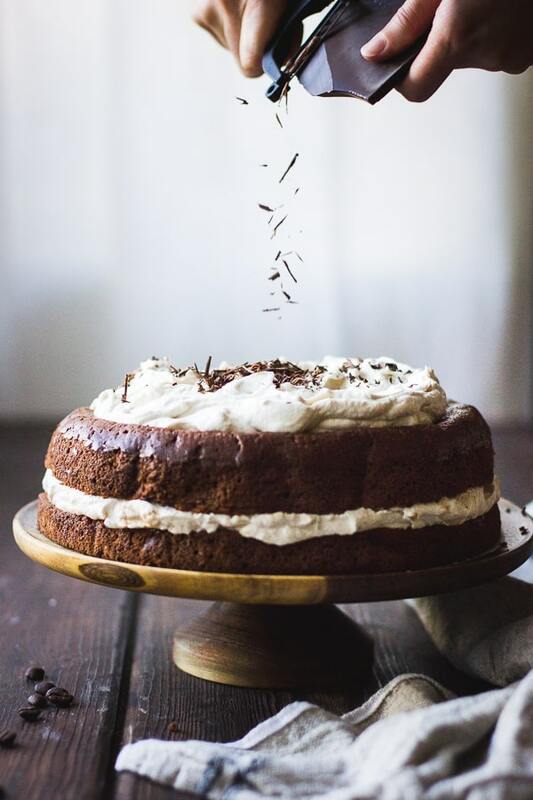 A beautiful cake with one of my favorite ingredients, chestnut! Alanna, this looks absolutely fantastic! 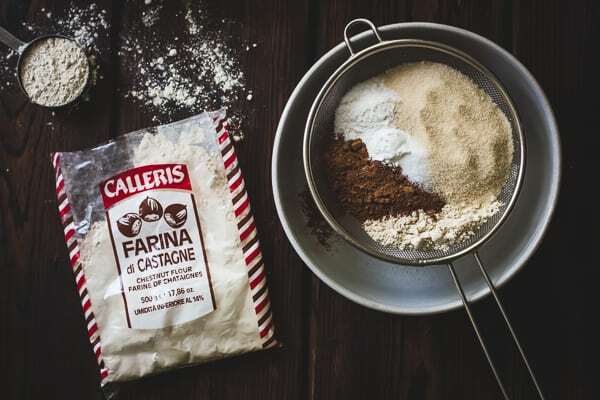 I bought a bag of chestnut flour a few weeks ago when I stumbled across it at this small Italian grocery store, but I hadn't yet figured out what to make with it. Thanks for the inspiration! I feel like I need this in my mouth immediately. Happy Holidays, and may the new year be filled with plenty more baked wonders! Thanks, Alanna! Please let me know if you give this one a go! I bet chestnut flour would be awesome in brownies or chocolate chip cookies, too. Happiest holidays to you too!! I would just like to let anyone who is curious about this cake know that I got to try a slice and OMG. It is PHENOMENAL. Make this now!!! I made this cake for Christmas for the gluten free women in my family who all happen to love chestnuts. It was a big hit, overcoming the serious obstacle that new desserts have in being welcomed to my tradition driven family. I think it is the most delicate, fluffy, gluten free thing I've ever made or tasted. Chestnut flour, who knew?! Yay!! Thanks so much for making it A! yay guten free! looks marvelous! I kind of want to stick my head right into the middle of that cake and eat my way out. Weird, yes. But it also feels appropriate. Your photos are always lovely, but these are exceptionally beautiful! 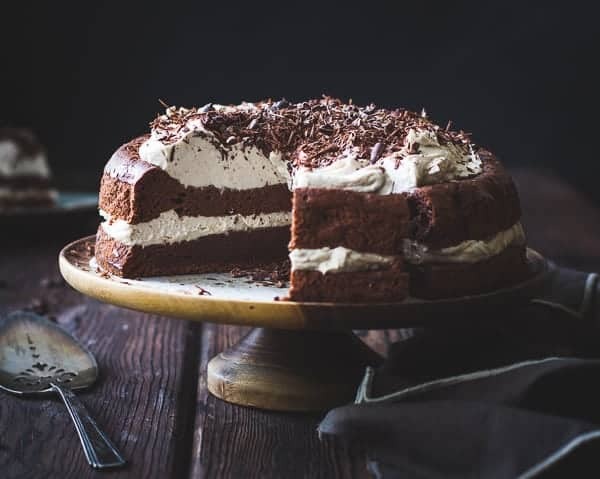 This might be the ultimate winter cake, it sounds exceptional! Wow, that's high praise from you – thanks!! Absolutely love this! looks like such a great recipe, I'll have to try it! 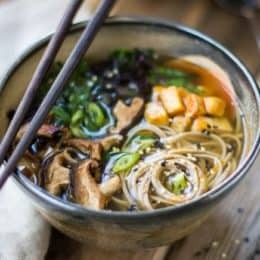 Also your food photography is incredible, any tips for a novice? I'd love to be able to take photos like that. Beautiful photos to go with a fab sounding recipe and you like Colin Firth. I'm about to sign up. I love your style of writing. "Like" is an understatement. :) Thanks! 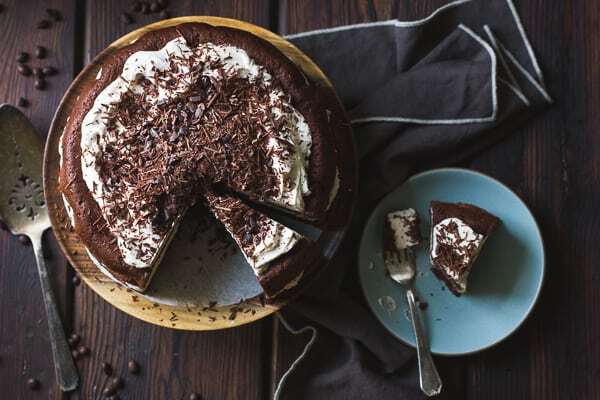 Hi looks good your recipe and in where i can buy sweet white flour or which other ingredient i can replace …like brow or white rice flour and the mascarpone is a cheese right? what other i can replace i don't like any cheese. Chocolate and coffee. I love both. Thank you, Alanna. You are a gift to mankind with this recipe. Can one use ALL chestnut flour instead of the rice + tapioca mixture? I'm not sure! It could work. Let me know if you test it out! I can’t wait to try this cake out. I also have to comment on the AMAZING photography, beautiful! I’m not a big fan of cake in general but this one has my full attention! Looks delicious!! I have been unable to find chestnut flour here in Maine (I live near Portland, a foodie city – go figure) and I don’t have enough time to order online to get it by this weekend, when I need it. 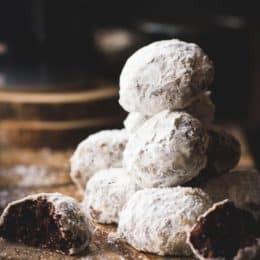 Is there another flour I can substitute here or is this a ‘go chestnut or go home’ recipe? Thanks! Hi Dawna – I’m with you! Bummer about the chestnut flour. But I’m guessing another GF flour or AP blend will work equally well. I might try oat, buckwheat or teff to get the earthy flavor and smooth texture. And you might try baking a baby batch with that sub ahead of time to see whether you like the results before committing to the whole shebang. Please please please come back and let me know how it goes! Your recipes and pictures are always so beautiful! 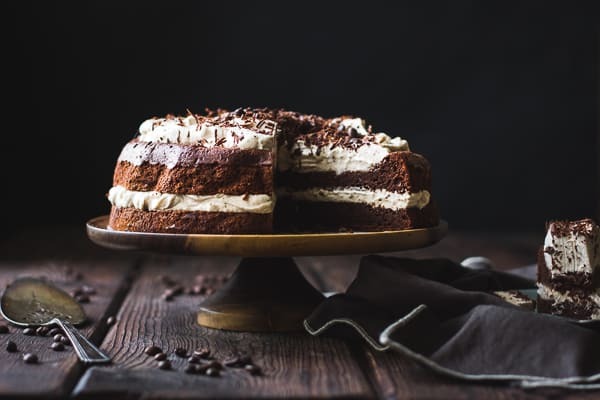 By far my favourite food blog :) Also, I love your sassy personality–chocolate cake with a side of sarcasm? The best guilty pleasure for sure. Thanks for a great read always! This cake is so beautiful! It looks delicious, too! This looks so so so beautiful!! i’ll definitely give it a try. Thanks for sharing such a lovely recipe. Hi, I love your blog and have had this cake sitting on my to-bake list since last winter. For those of us who eat gluten, would you suggest replacing all the flours with APF? or keeping the chestnut flour and replacing the other flours with APF? Thanks for your help! Hi Sama! Thanks so much for the sweet words! I think either of those should work, though you might need to play around with the recipe a bit to get just the right texture. Let me know how it goes! What could we use instead of rum to keep it alcohol free? I’d just use extra coffee.